In a medium sized mixing bowl, combine flour, sugar, baking powder, baking soda and salt. Whisk to combine. In a separate bowl, combine eggs, buttermilk, vegetable oil and vanilla extract. 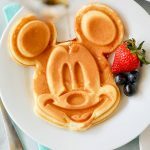 Measure 1/2 cup of batter onto Mickey Mouse waffle maker. Cook for about 3 minutes, or until golden brown.